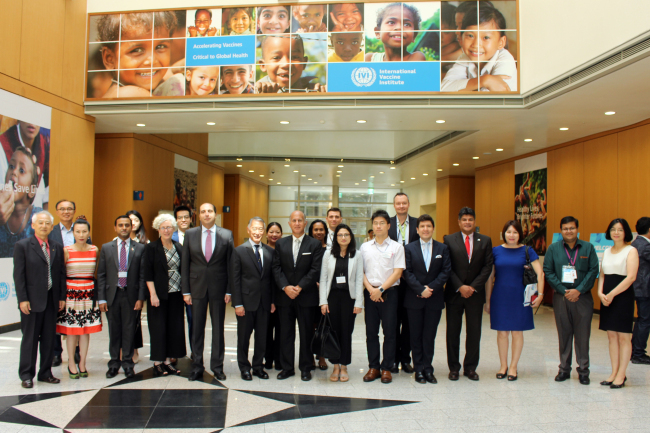 The International Vaccine Institute on Sept. 4 hosted foreign diplomats at its headquarters in Seoul and briefed them about its latest international projects and accomplishments. The institute also gave a tour of its laboratories to the envoys, who represent member states of the organization, which exclusively develops new vaccines to protect the world’s poorest people, especially children in developing countries. The meeting coincided with the 18th International Vaccinology Course, a weeklong event providing vaccinology training to professionals in diverse fields. Established in 1997, IVI operates as an independent organization under a treaty signed by 35 countries and the World Health Organization. The institute conducts research in more than 30 countries throughout Asia, Africa and Latin America on vaccines against diarrheal infections, bacterial meningitis and pneumonia, as well as Japanese encephalitis and dengue fever. At the Seoul headquarters, it develops new and improved vaccines. Participants at Tuesday’s meeting included IVI Director General Jerome Kim; Ecuadorian Ambassador Oscar Herrera; Lebanese Ambassador Antoine Azzam, IVI Deputy Director General for Government and Global Affairs Han Kyung-taik, Uddav Neupane of the Embassy of Nepal, Supanant Chan-Um of the Embassy of Thailand, Jhoanna Jarasa of the Embassy of the Philippines, Helen Aitsi of the Embassy of Papua New Guinea, Nayantara Dabariya of the Embassy of India, Honorary Consul General of Bhutan Kim Hun-koo, IVI Head of Epidemiology Florian Marks, Diomedes Carles of the Embassy of Panama, Carmen Azurin of the Embassy of Peru, IVI Clinical Immunology Scientist Ayan Dey and IVI head of Government and Global Affairs Cho Young-mi. For more information, visit www.ivi.int.